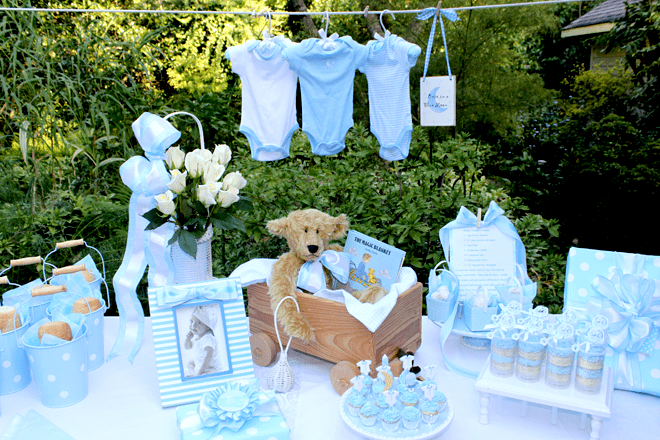 Planning a baby shower? 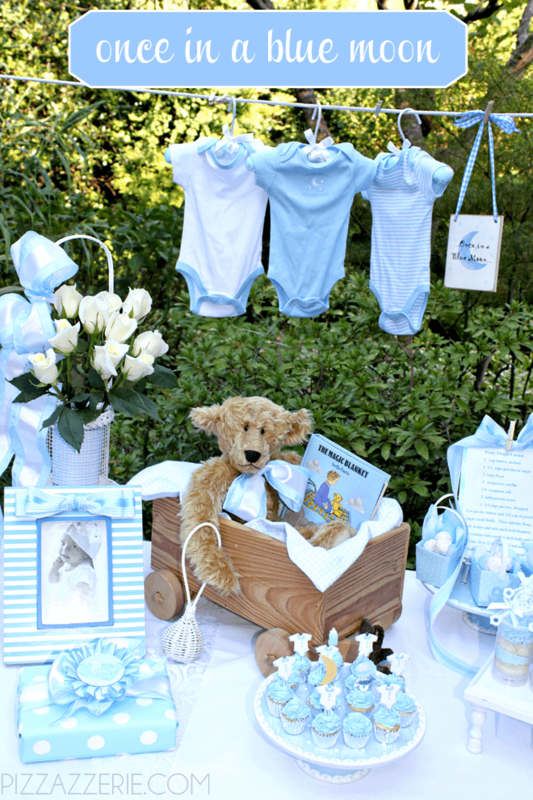 I just adore this traditional baby blue shower decorated with a “Once in a Blue Moon” theme! I just love the traditional touches and all the baby blue! Below are all the resources for where the items were purchased so you can throw your own baby shower! The book “The Magic Blanket” is nestled down in a cute wooden wagon for a sweet gift for Mom-to-be! The mini cupcakes with little onesie toppers are adorable. What an easy way to dress up your treats! I also love how the wrapping is coordinated to the shower. You can’t have this be the case for all guests arriving but definitely any gifts you’re giving to mom-to-be can be coordinated and serve as cute table decor as well! A simple line of ribbon or string can hold up cute baby onesies for mom! This is a great way to add decoration above your table! 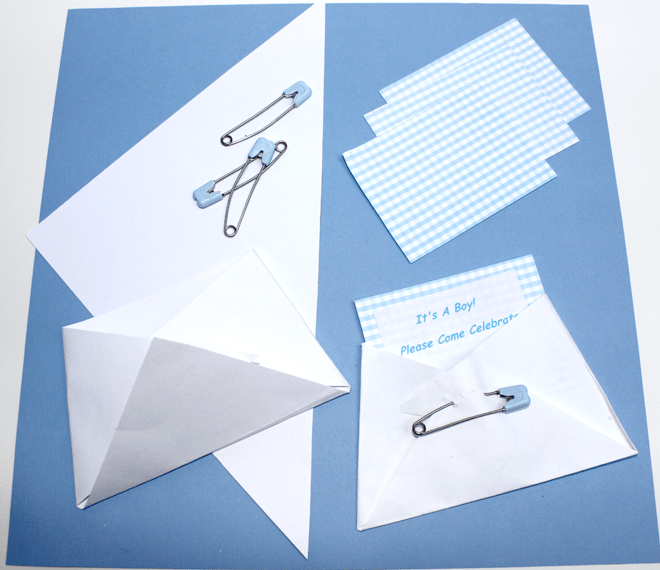 For a simple and cute shower invitation idea, here are the instructions for the one above. Here is where everything was purchased or found! Teddy Bear & Wagon: These belonged to me and my brother when we were little! Adorable Valentine’s Day Breakfast Party! Bright & Colorful Safari Birthday Party! Oh, I really like this traditional theme! I enjoy seeing how people create unique themes, but you just can’t beat a sweet baby blue theme. Hi Lisa! I agree with you! Thanks for the sweet comment! Such adorable styling! And such darling ‘diaper’ invites! This is so sweet. Love the teddy bear, and the clothesline. Too cute. Hi I love this theme it is perfect. I would love to know how the cupcake toppers are made (edible or not). Thank You. Your Blog is inspirational. Fiona ~ the cupcake toppers are just scrapbook stickers stuck to shortened straws – so they are not edible but you could make them with rolled fondant. Have fun getting creative! Pleasssse post more Tiffany blue & pink party themes!!! Very cute! Im planning a boy shower for my sister. What is in the bucket?? This is the cutest shower! I love the theme! Where can I find the “little Onsie” toppers for cupcakes? 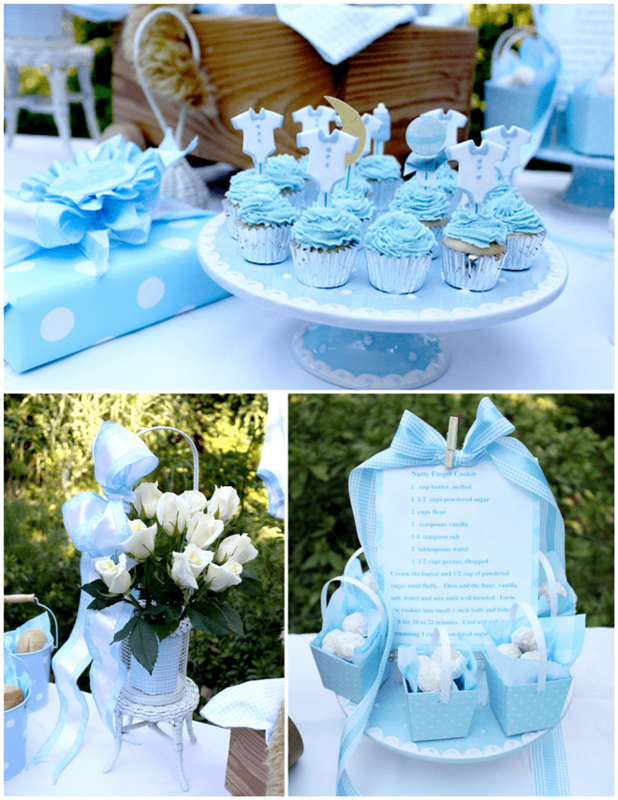 Also, The baby blue & white pedestal cake holder? Having a Baby shower for my daughter… a Boy….we sent out Adorable Onsie invites…White with a Blue Bow-tie with white polka dots…Gonna keep that theme…. and Put a Lovey Blanket …and Hanky blanket from Little Giraffe…But would love to accessorize with the many Wonderful Blue Moon ideas! Hi I love this theme! Do you recall where you got the basket that the roses are in? Thank you. Stephanie! Let me ask my Mom, she styled this one! Stay tuned!